Too often in our society we attempt to “serve others,” addressing only one side of the equation without considering the tremendous learning potential both academically and ethically as individuals and as interconnected citizens. Service learning challenges us to balance our approach to problems by employing a principle of reciprocity. When students identify, examine, and research societal inequities and plan a course of action to respond using rich and varied methods, they strengthen their knowledge base through direct application of skills and service. Our purpose extends beyond any single constituency group and seeks to engage parents, faculty and staff, alumni and fellow members of our local and global community. An integral component of our mission, Country School's Community Service programs teach social responsibility. They inspire and empower our children to make positive contributions to the world, both while they are students here and throughout their lives. We provide opportunities for students to engage in projects that not only help others, but also nurture self-confidence, independence and the skills that will enable them to be effective leaders and contributors after they graduate. Community Service projects are age appropriate and take place after school on Wednesdays or on weekends, with support from parents, faculty and school staff. Recognizing that different causes appeal to different individuals, our activities are designed to give the students exposure to many areas where their efforts can make an impact, including: the environment, seniors citizens, disaster relief, poverty, animal welfare, education and support for troops stationed overseas. NCCS has a longstanding relationship with The Food Bank of Lower Fairfield County and is one of FBLFC’s biggest contributors year to year. Each November, parent volunteers conduct a school wide food drive. In the second half of the year, each class in the lower school engages in an age appropriate workshop in which they learn about the issues of food insecurity and the working poor. Individual classes hold their own food drive, often competing with other classes to see which can bring in more food. Finally, grades 2-4 have the opportunity to visit the food bank with parent volunteers in the spring. There, they learn about how the food bank works, the people it serves and even get to help stock the shelves and weigh the food. On Saturday, April 11, 2015, the New Canaan Country School Parents’ Association, in conjunction with the Office of Community Development, will sponsor the first annual Kyle A. Markes Day of Service. The event will feature community service projects, hosted both on and off campus, during which participants will serve with, and learn from non-profit organizations in honor of Kyle Markes and his family’s history of public service. NCCS families will have the opportunity to come together to learn about the mission of various non-profit groups, and to actively participate in projects that will benefit important causes. Most projects have been designed to accommodate a wide variety of ages. No expertise is required - only a willingness to open your hearts and lend a hand! On select (half day) Wednesday afternoons throughout the year, the PA Community Service team puts together programs to expose students from all grade levels to a variety of charitable, non profit organizations. Sometimes, programs will be specific to a certain division, but often the project will involve a range of students from throughout the divisions. Typically, the afternoon will begin with everyone gathering for a communal brown bag lunch. Next, a representative from the agency will speak to the students about what they do and the people they serve and answer any questions. The students then engage in a meaningful project to aid the organization. Some of the agencies we’ve worked with frequently in the past are: Kids in Crisis, Family and Children’s agency, Ghana Children’s Fund, Education and Hope, and New Canaan Inn. 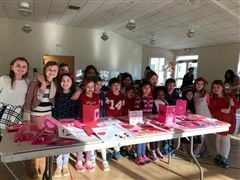 More than 20 students met in the Motor Room of Thacher last Wednesday to decorate and design Valentine’s cards for Meals on Wheels recipients.